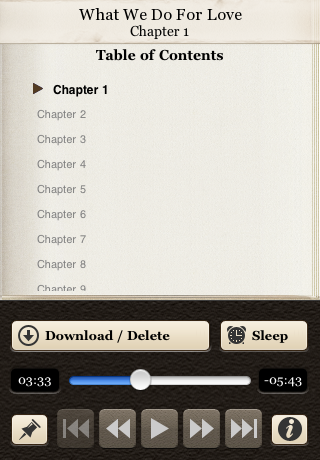 This application contains a professional recording of What We Do For Love -- wrapped in a beautiful and elegant player to create an immersive and enjoyable audiobook experience. 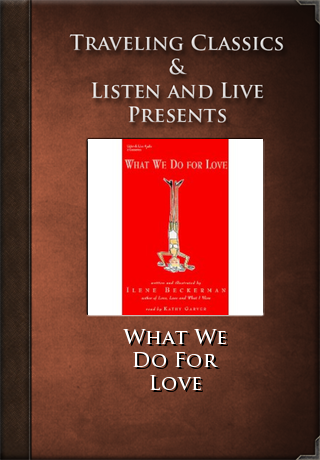 In What We Do For Love, Ilene Beckermen tells her funny, sometimes heartbreaking story that every woman who's ever searched for love will recognize. The First Crush. The phone call that doesn't come. The makeovers after the breakups. And the exchange of marriage vows. Beckerman looks back on a lifetime of trying to find true love. She remembers sneaking out of the house to neck with her high school boyfriend, dancing cheek-to-cheek with her first husband, and settling down with her second. But even he is not the man of her dreams. Through it all, Beckerman holds on to the possibility that there might be someone out there who's just right for her. And, as it turns out, there is. What We Do For Love is a moving, humorous reminder that when it comes to love almost anything is possible!